Youth's Companion Building, Boston, Mass. The armature is a modification of the well-known Siemens type. The winding of the armature has been most carefully designed, the object being to design an armature that would produce the current without the destructive sparking common to most machines, and at the same time to do away with all unnecessary losses due to Foucault currents and other sources of loss. The armature is very carefully balanced, in order that it may run perfectly true and without the slightest vibration. So carefully is this point worked out that a 1,000-light dynamo cannot be heard at a distance of a few feet, when in operation carrying its full load. The proportions of the armature and field are such that when operating under full load continuously there is no unnecessary heating. This is an extremely important point, as many dynamos cannot be run under full load any length of time without heating to a dangerous degree, with the accompanying great waste of power. All Mather dynamos may be run under full load for any length of time desired. The shaft is of the best quality of steel, ground on dead-centres; it is of ample size to ensure stiffness and to prevent any tendency to "springing." The bearings are self-oiling, and the plan employed ensures the continuous flooding of the entire length with oil. By reference to the cut, it will be seen that the journal runs in a hard metal bushing held in a yoke in which is an oil cavity. A notch is cut in the upper side of the bushing. In this notch runs a ring, which rests on the top of the shaft and surrounds the bushing. 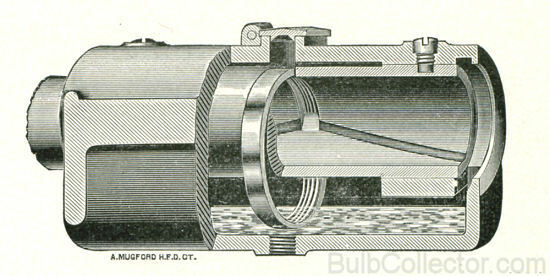 The lower side of this ring is in the oil in the oil cavity, and the oil brought up by the ring is caught by the edges of the notch in the bushing, and flows through grooves inside the bushing and extending obliquely downward to the ends. When the machine is running, oil flows in constant streams from the ends of the grooves. The most delicate and sensitive parts of a dynamo are the commutator and brushes, as they are subject to constant use and wear. It is at this point that the perfect balance, electrically and mechanically, of the Mather dynamo is most conspicuously shown. The dynamos of other systems always spark more or less at the commutator. 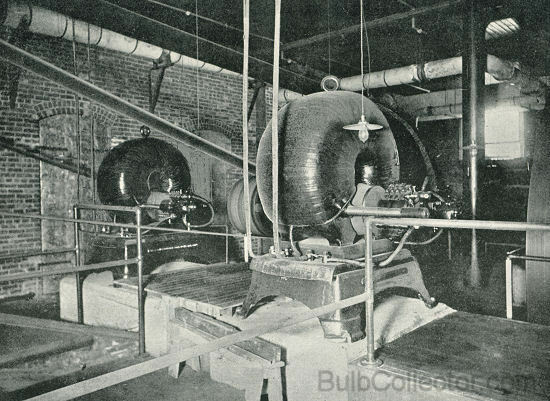 Sparking at the commutator is the cause of most of the troubles that come to users of electric lighting apparatus; it always means the consumption of metal; always produces a roughened surface on the commutator, which soon causes it to be turned down, thus soon necessitating a new commutator at considerable expense. In the Mather dynamo this destructive evil of sparking is entirely overcome. The methods of constructing the commutator and of winding the armature are such that without the aid of outside appliances of any kind the machine runs absolutely without sparking when once the brushes are properly adjusted. The brushes are so arranged that each can be adjusted independently; or by a simple and effective device all can be set or removed from the commutator by a single movement. The brushes are arranged that one or more may be removed from the brush-holder while the machine is in operation, without in any way affecting the running of the machine or the lights. No system of artificial lighting can be considered thoroughly practical which is not entirely flexible and which does not allow all the lights to be used or not, as desired. The manufacturers of all systems have realized this and have endeavored by various devices outside the dynamo itself to render their systems automatic. " Automatic Regulators," so called, have been used, but universally without success. The Mather dynamo is a perfectly automatic machine in itself, regulating absolutely under all changes of load, without outside "regulators" or other devices; the brushes once properly adjusted, no further attention is necessary, even under extreme changes of load. The Mather dynamo is also automatic in its consumption of power, requiring power only in exact proportion to the amount of actual work being done at any given moment. 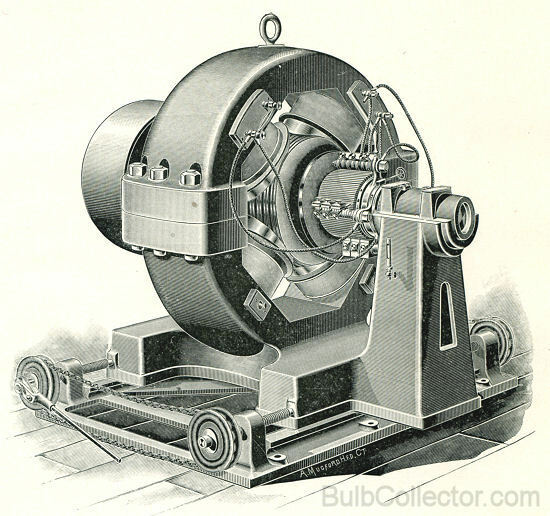 The Mather incandescent dynamo being built upon thoroughly scientific principles carried out with the best mechanical construction, as described above, gives the highest commercial efficiency of any dynamo in the market, combined with the greatest simplicity and least liability to get out of order. The Mather dynamo does not require special or expert care; any engineer can operate it with perfect success, and so little time and attention are required in its operation that it will not interfere in any way with other duties. The Mather dynamos are manufactured in capacities varying from 50 to 3,000 lights of 16 candle-power each. They are regularly constructed with compound winding for a constant potential of 125 volts, but can be furnished of any desired potential to order at short notice. Special machines for marine and other situations, where the conditions require other than the regular type of machines, are supplied promptly. 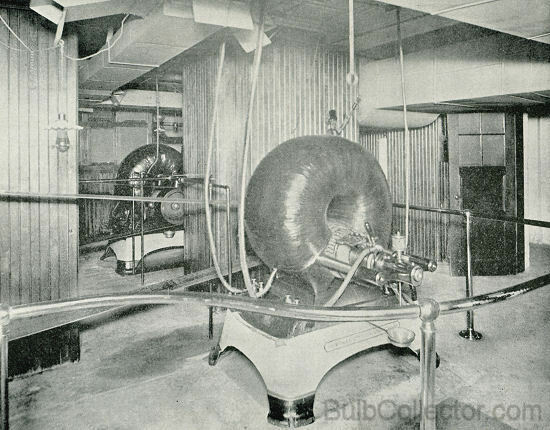 All the machines manufactured by the Mather Company are mounted upon substantial iron subbases fitted with adjustable screws for controlling the tension of the belt. The dynamos are so constructed that the armatures can run in either direction as desired. This type furnished from 1,000 to 3,000 lights capacity.